Messiaen's Mode 6 is a symmetrical scale that can be made by adding two notes to the Whole Tone scale. Adding one of these gives us Neapolitan, so I thought it was probably time to look at the other one. To be honest, I haven't given a lot of thought to Messiaen's "modes of limited transposition" for a long, long time. Symmetrical scales? Pah. I've got them all listed, and most of them seem to just be various combinations of diminished and augmented arpeggios, and in the field they just look like little groups of semitones spread evenly through the octave. They just didn't seem too promising to me as resources. I've since learned that when the masters speak, it's worth lending an ear. There are secrets hidden in Messiaen's Technique of my Musical Language (PDF) that remain to be discovered. Here's something very small, but maybe it was a secret until today. The whole-tone scale has no modes -- its interval map is whole-whole-whole-whole-whole-whole and its spelling is 1 2 3 #4 #5 #6. This is usually played over augmented chords or, in a jazz contaext, the 7#5. It works over 7b5 too, but watch out for altered ninths, and at a push even over 7#11, aka "Lydian Dominant" type chords. So jazz players tend to know it. Also, since it's so symmetrical it lays out on the fretboard in extremely easy-to-learn patterns. Whole Tone does have one hypermode, whose spelling is b2 b3 4 5 6 7. This can be found very simply in any situation: simply play the Whole Tone scale that doesn't include the root of the harmony. I like to think of the 7 and b2 as a chromatic enclosure around the root; from this everything else just falls into place. I like this on minor chords as a variant on Melodic Minor. With hypermodes, it's common to add the root back in; then of course you get 1 b2 b3 4 5 6 7, which is known as the Neapolitan scale. This scale isn't symmetrical at all; it has seven modes and five hypermodes like any other heptatonic scale does. One of its hypermodes comes from going back to the Whole Tone hypermode, b2 b3 4 5 6 7, and treatng the 4 and 5 as a chromatic enclosure around the b5, giving you b2 b3 4 b5 5 6 7. This is an interesting sound too. If we add the root back in now, we get Messiaen's Mode 6: 1 b2 b3 4 b5 5 6 7. And the easy way to think of this is as Neapolitan with an added b5. Any improvisor worth their salt can find the flatted fifth pretty easily, so if you already know Neapolitan this is a breeze to play. Another way to say this is that Mode 6 is the Whole Tone hypermode plus the tritone at the root. Or that it's "one Neapolitan at the root and another at the b5". This last way to look at it is very appealing to me from a practical improvisation perspective. Isn't it just a "tritone sub for minor chords"? Sort of. I can definitely think of it this way. So then which other Neapolitan hypermodes can be added to the basic one to get interesting results? Adding the root back into any of these gives a new eight-note scale that is incredibly easy to find. You just have to remember which extra note you're adding to the Whole Tone hypermode -- literally just one note. The first and last of these aren't very interesting -- 7 1 b2 2 b3 is four semitones in succession, as is 6 b7 7 1 b2. But the middle two have some promise. I'd like to give them memorable names but for now I'm calling them Neapolitan Add 3 and Neapolitan Add #5. They're not symmetrical, so if you like them there are 16 modes here to explore. In both cases the coscales are four-note fragments of the Whole Toen scale, so these should be pretty easy to find too. Those things I thought looked trivial turn out to be pretty rich structures after all. 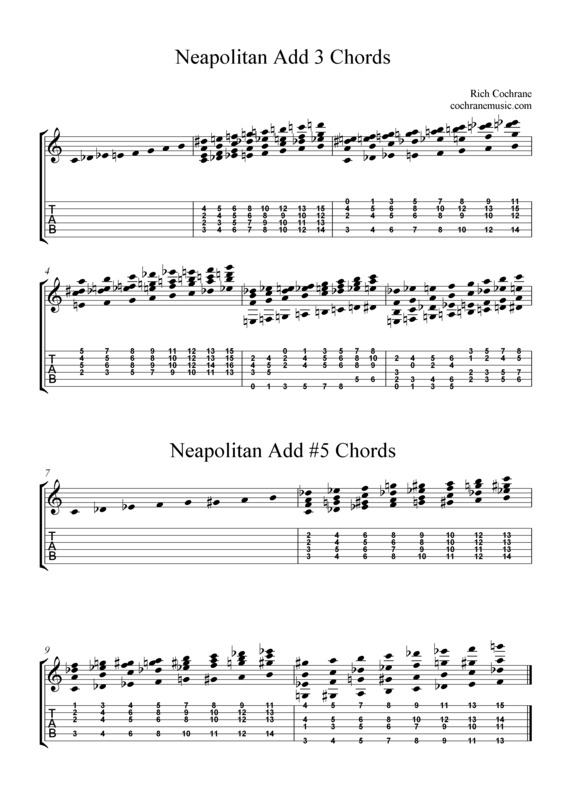 I'm still wrestling something out of Superaugmented (more to come on that) but I hope to get to grips with these "Neapolitan add scales" at some point this year.